Mumbai: The rupee stayed weak in afternoon session on Tuesday as investors pulled out funds from the domestic share market which dropped nearly 2% on expectations the global economy could be plauged by another recession. 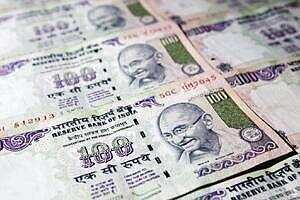 At 2:25pm, the partially convertible rupee was at 49.35/36 per dollar, weaker than its previous close of 49.15/16. World stocks hit a fresh 15-month low on Tuesday while the dollar neared a nine-month peak on growing doubts over Greece’s ability to avert a default that would spark a major banking crisis in Europe and accelerate a global economic slowdown. The 30-share BSE index, which is one of the worst performing indexes this year, was down nearly 2%. Traders said the rupee could fall more in coming days because of a worsening current account deficit and fears of fiscal slippage. The euro hit a nine-month low against the dollar and a 10-year low against the yen on Thursday, as euro zone policymakers failed to quell rising concerns over a Greek debt default, hitting riskier currencies and boosting the greenback. Data released last Friday showed India reached 66% of its full-year fiscal deficit target in just five months, and the current account deficit widened to $14.1 billion in the June quarter, compared with $12 billion in the same period a year ago. The rupee, which has fallen 11% from its July peak, is unlikely to breach a 28-month-low of 49.90 reached on 23 September, traders said because of expectations the central bank would intervene. “Inflows are trickling into the country from corporates. exporters too have been selling dollars," said a dealer at a private sector bank. The Reserve Bank of India, which steps in to smooth excess volatility, is suspected to have intervened in September when the rupee had touched 49.90. The one-month onshore forward premium was at 23.50 points from 24.50 on Monday, the three-month was at 58.75 points from 60.50 and the one-year was at 111.75 points from 118.25. The one-month offshore non-deliverable forward contracts were quoted at 49.54, weaker than the spot rate and indicating a bearish medium-term outlook. In the currency futures market , the most traded near-month dollar-rupee contracts on the National Stock Exchange, the MCX-SX and on the United Stock Exchange were all at 49.46. The total traded volume on the three exchanges was $1.4 billion.